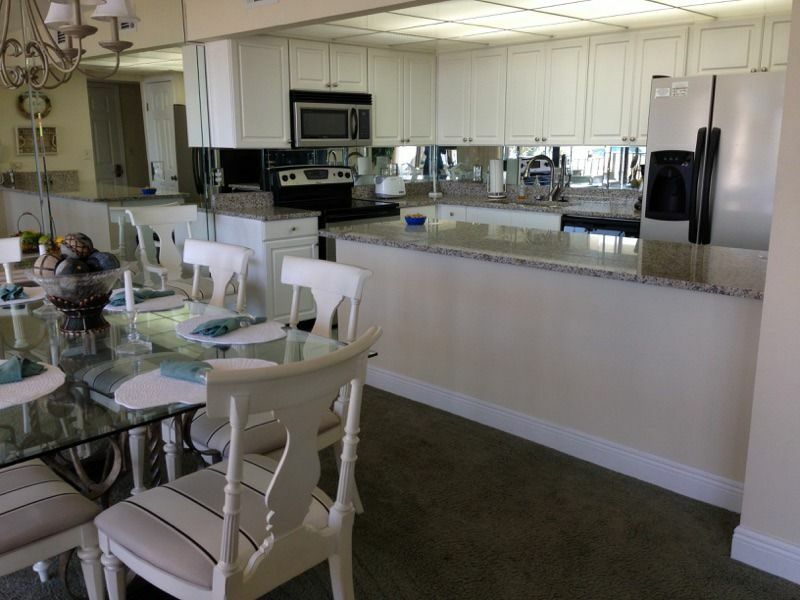 2BR/2BA Edgewater PCB OCEAN FRONT!!! Convenience means easy access to the famous beach side Lagoon Pool and Hot Tubs, a quick walk down to the beach or down to your car. No need to wait at the elevator. This unit is one short flight up to your, recently remodeled, luxurious, beach front condo (of course the elevator is still available if you prefer to ride instead). You will love the new carpet, ceramic tile, and wallpaper in this deluxe two bedroom unit. The Mirrored walls surround you with gorgeous views of the Lagoon Pool, waterfalls, palm trees, tropical plants and of course the beach. It is a tropical paradise in the center of Panama City Beach. The unit is beautifully decorated and fully equipped for all your vacation needs and enjoyment. My husband and I own and personally manage our unit. We want you to be 'OUR GUESTS' at Edgewater this year. Please give us a call so we can tell you just how special our unit is! Just ask for Anne. I love telling guests about our condo and how easy it is to rent directly from an Owner! The condo is AMAZING !! I love being on the first level. No elevator ! Thank you. We are so glad you came back to visit us again!! Enjoyed everything about our stay! Condo was perfect for our family and the location was great!! Can not wait to rent again in the near future! So happy your stay was enjoyable. Wonderful condo. Great view, easy access to everything, well stocked. Location of the room was absolutely perfect!! We never had to take the elevator (which took forever) easy walk to the pool, beach and the little mini mart. The room was on the 2nd floor and right beside the stairs. My whole crew couldn’t stop talking about how perfectly located this room was. The view was great even from the 2nd floor!! We got a parking space right by our room so we literally just walked down a few stairs and was right to our car. It was perfect for me with a small toddler and my grandmother. The room was clean, nice and Spacious. We had no concerns about the room, we loved it. If we come back to Panama, we will definitely stay in this room again!! We absolutely loved the condo. It's perfect in every way. We have 2 teenagers and a set of twins that is 11. Everyone loved it here. We will definilty return and only stay in this condo. Anne had everything we needed . We never used the elevator and could see right into the pool area. The parking is great because you don't have to use a parking garage. We ate at both restaurants and enjoyed both. I have no negatives about the resort or condo. Would recommend it to anyone. Thanks. Thank you so much. It was a pleasure to work with you. I book a year in advance so when you have dates we stand ready.